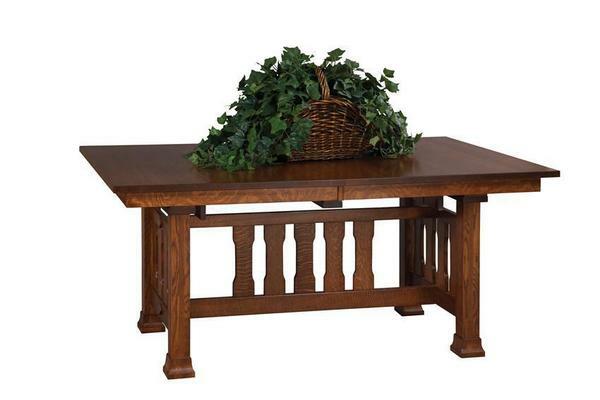 The Amish Monterey Mission Trestle Table offers a lovely look for dining rooms. Solid wood is styled in simple mission style with a trestle base that showcases fine woodworking. The legs are rich, thick and squared, while the base is lined with creative slats. Add Monterey Mission Dining Chairs and you've completed an amazing dining room set. As you sit across from a loved one, enjoy a table that will serve for generations and that comes with the custom look you want. Order online or please email or call us today. An Amish Furniture Specialist will be happy to help you.